Over the years I have talked about an annual Oswego fishing season spectacular that is akin to fishing in brown trout heaven. A unique set of circumstances, a combination of warm nutrient rich shoreline river water plumes, favorable shoreline and bottom contours, and near shore predator feeding patterns, make for some of the best brown trout angling opportunities on the entire lake. This brown trout happening occurs just about each and every spring. As the season segues from spring to summer, if you move gradually to deeper water your brown trout successes will only continue. If you choose to stay with the browns you can catch them well into August and on most days never have to wander more that 2 to 3 miles off shore. The fact is brown trout do not wander very far from their birthplace or in this case the area in which they were stocked. While salmon will roam, Mr. Brown stays at home. So a combination of warmer nutrient rich water luring baitfish and plenty of inquisitive, hungry, predators, presents a fish catching puzzle that is generally easy to solve. 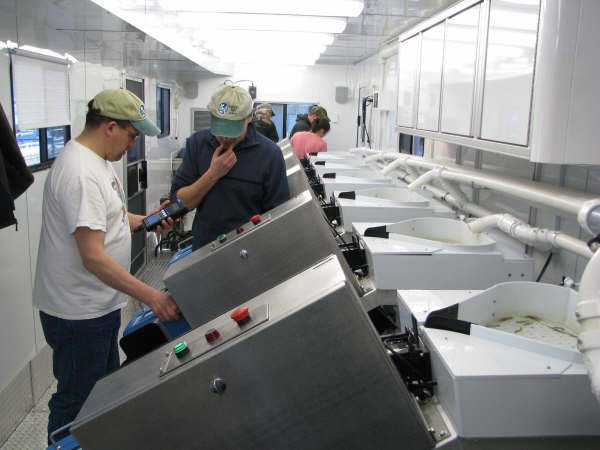 Here is an interesting info tidbit as to why you might want to choose Oswego for your next brown trout outing. The last three NYS Record Brown Trout, led by the current NYS Record 33lb, 2oz monster were all caught from Oswego east to an area known as the "High Rocks", just east of Nine-Mile Point. If that fact is not enough to attest to Oswego's big fish reputation, I don't know of a better testimonial. 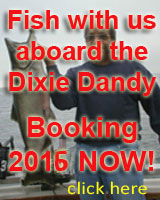 By the by, the current NYS record brown was caught on our vessel, the Dixie Dandy. The prime factor influencing the brown trout bonanza is the Oswego River and the immense flow of warm water emptying into the lake. It is the odds baby, and the odds are in favor of the Oswego River and the numerous smaller tributary waters that enhance the big rivers fish magnet characteristics. Now that I have explained why the Oswego area provides great Brown Trout fishing here is a tip that can make an outing even better. Fish on Monday, Tuesday, or Wednesday. There are a couple of reasons why one should consider this option. 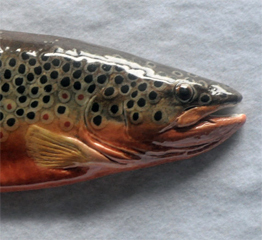 First it is a fact that Brown Trout are a skittish, wary, fish. They are line shy, and noise shy, especially from the sounds caused by boats. Secondly, when fishing for browns you will do best when fishing away from boat traffic and if the water is crystal clear running lures far from the boat. So why do Mondays, Tuesdays, and Wednesdays increase catching odds? Read on! In the spring there is plenty of boat traffic because most anglers are aching to get back on the water after their share of winter doldrums. Everyone is excited about returning to the lake, hence heavy boat traffic. Heavy boat traffic means plenty of noise on and in the water. On some spring days the concentration of fish might be in the Oswego Harbor. On the weekends plenty of fish are feeding in the harbor causing numerous boats to troll in the confinement of the surrounding sea walls. If the lake is too rough to fish, the harbor area provides protection from the rolling seas. It doesn't take long before you are trolling in a maze of vessels large and small all trolling with plenty of lures in the water sometimes only 30 to 50 feet apart. Before you can yell, "fish on" tempers can flair, tangles can occur, and the joy of fishing can quickly become a painful experience. Crowded weekend fishing gives way to more solitary opportunities as most anglers return home on Sunday leaving the next few days open for pressure free fishing with almost non existent fishing vessel armadas. Monday to Wednesday trips allow ample trolling room all along the shoreline. 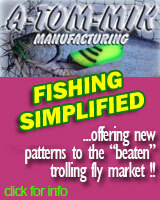 If the water is crystal clear running lures far back in your trolling pattern makes those wary browns more cooperative. Many times this is not possible on those crowded days. One last thought. When fishing for browns it is always more productive to be able to fish far from other boats if you can. On crowded weekend days, it is tough to go solo. Make a couple of circles because you are getting plenty of strikes and you will soon have company because experienced anglers are savvy to the movement of vessels that are catching fish. In addition inexperienced fishers search out other boats especially if several vessels are fishing in a cluster. Take it from me, clusters are not good. On land they say "build it and they will come". On the water they say "catch a fish and they will come. On Mondays, Tuesdays, and Wednesdays, fewer will come since fewer are on the water. It is harder to generate a cluster. Basically you can fish where you want, troll at the speed you want, and run your lures where you want. Now who wouldn't want that? When I started fishing on the big O, boat to boat communication was very different that it is today. The internet, cell phones, texting and other social media have revolutionized the information highway. 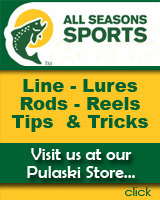 Basically it means that getting good information on where to fish and what to use is just a click away. Today everyone is a world class fisherman, at least on Facebook. Just ask and they will tell you. After all, if you read it on the internet it must be true. I guess what I am saying is if you can, fish on light boat traffic days, fish away from everyone else, and don't answer the phone. Fishing on light boat traffic days, and fishing away from other boats is doable. Not answering the phone is probably asking too much. In any event, adhering to a few basic brown trout fishing skills will definitely improve your catch rate, especially on Mondays, Tuesdays, and Wednesdays. Be quiet, be alone and be successful.